The density of crude oil processed by U.S. Gulf Coast refineries has become lighter since 2008 as refineries moved away from heavier imported crude oil to lighter crude oil produced in Texas. The Gulf Coast is home to most of the nation’s petroleum refineries, and these refineries tend to run a diverse mix of crude oils that, similar to the national average, has become lighter since 2008. API gravity is a measure of crude oil density that refiners consider when making decisions about the types of crude oil to process. Crude oil with a higher API gravity is lighter, or less dense. Small changes in the API gravity of the combination of crude oils that a refiner processes, called the crude slate, can affect the profitability of the refinery and the shares of petroleum products produced. Between 1985 and 2008, crude oil inputs to refineries in the Gulf Coast (defined as Petroleum Administration for Defense District 3) were getting heavier, from an API gravity of 34.1 degrees in 1985 to their heaviest at 29.5 degrees in 2008. At about the same time, imported crude oil processed in the Gulf Coast was increasing from 1.4 million barrels per day (b/d) in 1985 to its highest level of 5.8 million b/d in 2004. 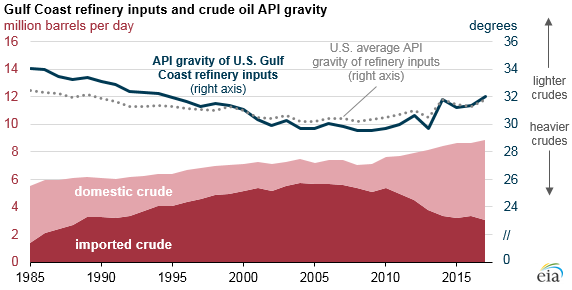 That trend reversed between 2008 and 2017, when the API gravity of crude oil inputs to refineries in the Gulf Coast increased to 32.0 degrees and imported crude oil processed in the region decreased to 3.1 million b/d. 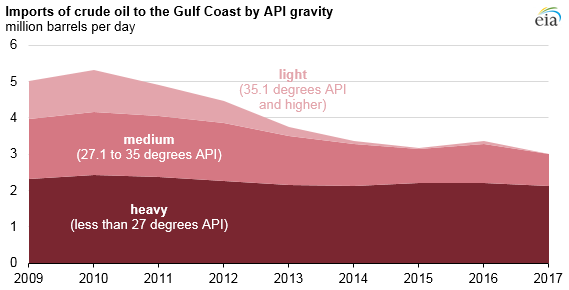 Most imports of crude oil to the Gulf Coast region are relatively heavy, as crude oils less than 27 degrees API accounted for 46% of the region’s imports in 2009 and 71% of regional imports in 2017. Relatively lighter crude oil imports accounted for 21% of imports in 2009 but had virtually disappeared by 2017. Gulf Coast refineries substituted imported crude oil with domestic production. 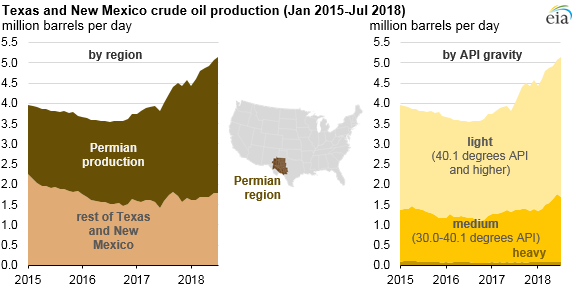 Since the beginning of 2015, most of the increase in domestic crude oil production in the region has been relatively light oil of at least 40.1 degrees API because of the increase in production from the Permian Basin, which produces mostly light oil from tight formations. In EIA’s refinery operation surveys, the Gulf Coast region is separated into five refining districts: Texas Gulf Coast, Texas Inland, New Mexico, Louisiana Gulf Coast, and Northern Louisiana and Arkansas. The Permian Basin is located in the Texas Inland and New Mexico refining districts, where crude oil inputs account for a comparatively small portion (9%) of total Gulf Coast refining. The capabilities of refineries in these two districts, and their proximity to light production from the Permian Basin, result in them having a lighter crude slate than the other refining districts in the Gulf Coast region, which have relatively easier access to imports of heavy crude oil. The recent Permian production increase could lead the Texas Inland and New Mexico refining districts to process more light oil from the Permian, further lightening the crude slates in those regions. However, refineries in those regions could face other limitations, as lighter crude oil input slates can lead to operational inefficiencies in refineries.